1. Preheat the oven to 200ºC, gas mark 6. Toss the potatoes with olive oil, rosemary and garlic in a roasting tin. Cook for 30 minutes, then turn before cooking for a further 15-25 minutes, until browned and tender. 3. When the potatoes are almost cooked, make the salad. Mix the lime juice, oil and some seasoning together. Toss gently with the remaining salad ingredients. 4. To serve, split each potato in half, top each with a generous teaspoonful of the crab filling and scatter over a little reserved cress. Serve with the salad alongside. These also work as canapés. 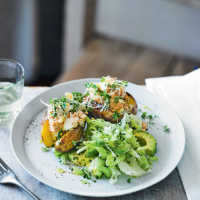 Bake the potatoes, make the crab filling, salad and dressing ahead, then just reheat the potatoes and assemble all together when needed.